This is a simple and flavoursome version of the classic French dish but adapted to be very quick to prepare and easy to make while outside. Chop all the vegetables in to chunks and put into a tagine or casserole dish with a lid. Crush the garlic cloves and add to the dish. Add the passata and fresh tomatoes and some water so that the vegetables are just covered. Mix the olive oil in to the vegetables and add the herbs. Place in the top oven on the stone for approximately 45- 60 minutes. Check occasionally to make sure there is enough liquid. Serve with baked potatoes, warmed ciabatta or grilled meat or fish. 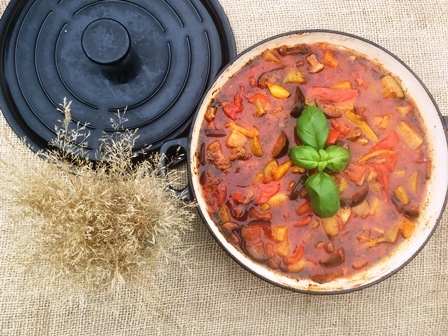 Cast iron tagine or casserole dishes work particularly well with the Aquaforno as the heat is retained and this speeds up the cooking without burning the food.